The Brewster Fall Festival is scheduled for September 8, 2019. Plans are underway to make it even better than last year. So stay tuned! Brewster Fall Festival Has Something for Everyone! Get ready to spend September 9th at the Brewster Fall Festival as Main Street in Brewster, NY is turned into this annual community celebration. Formerly known as Brewster Founders Day, this event marks the 27th year for this FREE family-friendly event. Lining Main Street will be a variety of merchants, community organizations, local businesses, crafters, artists, veterans’ organizations, politicians, historical societies, health & wellness services, jewelry, books, churches, and food vendors. Kids of all ages can enjoy an assortment of fun activities including a dunk tank, face painting, petting zoo, pony rides, games, bounce houses, spin art, and a pie-eating contest! While many activities are free, some will cost a small fee. Have you ever dreamed of being an award-winning baker? The Brewster Fall Festival is your chance to show off your culinary expertise! The inaugural Brewster Bake Off will be held as part of the many new festivities. Submit your entry for free in the category of cake, cookie or cupcake. 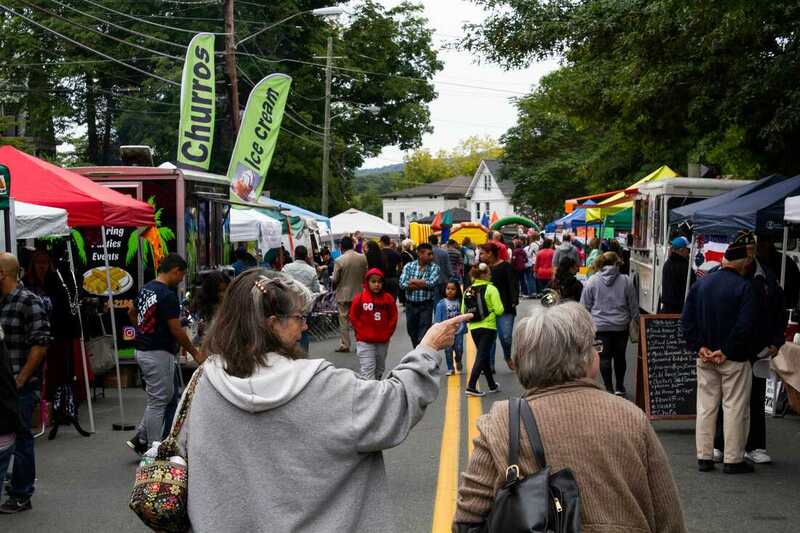 Speaking of food, come with an appetite as the Brewster Fall Festival has a variety of culinary delights including BBQ, burgers, hot dogs, vegan, Italian, tacos, drinks, churros, soul food, ice cream, and baked goods. Free live music and entertainment will be provided throughout the day. The Cultural Arts Coalition is organizing the Brewster Fall Festival. Stop by the Old Town Hall Theater at 67 Main Street to hear about the progress of the theater restoration and take a photo at the Selfie Station with costumes provided by DB Productions. The Brewster Fall Festival Committee wishes to thank all their sponsors including Open Door Family Medical Centers, Brewster Senior Housing Foundation, Confident Homes, Inc., Brewster HamletHub, Six Diamonds Tree Service & Landscaping, Sandy Quezada-Sola of the World Financial Group, and The Outlaw BBQ! The Brewster Fall Festival will be held on Sunday, September 9, 2018 from 11am – 4pm. Free parking is available Tristate Commuter Lot is on Park Street and Morningthorpe Ave. Trolley service courtesy of Putnam County will be available to bring festival goers between this parking lot and Main Street throughout the day. Visit on Facebook at Brewster Fall Festival or www.BrewsterFallFestival.com for more details. Although summer has just begun, the Cultural Arts Coalition is busy planning the Brewster Fall Festival (formerly known as Brewster Founders Day). This annual event will be held on September 9, 2018 on Main Street in Brewster. Registration for booths at the event is live at www.BrewsterFallFestival.com. Vendors, businesses, and organizations are encouraged to participate by purchasing a booth space. The Village of Brewster will close Main Street and booths will line both sides of street. Discounts are available for those in Brewster, Patterson, Southeast and Putnam Lake, 2018 Brewster Chamber Members and not-for-profit organizations. At a recent interest meeting held at the Studio Around the Corner, community members were invited to share their ideas and experiences to enhance the event. Those in attendance not only offered great ways to engage the community but also volunteer their time to join the committee and assist with the plans and at the day of the event. Rebecca Rabinowitz, local business owner of CPREd, offered the suggestion of giving the event a country feel by adding old-fashion games like three-legged races, potato sack and a pie-eating contest. Nancy Hack of the Landmarks Preservation Society of Southeast plans to offer historical activities at the Walter Brewster House. Mary Bomba stated that the event was instrumental in her finding out about the community when she moved into town a few years ago and is now helping to continue the tradition by volunteering in the pre-event planning and helping at the Brewster-Carmel Garden Club booth. Any one interested in joining the fun should visit sign up for a volunteer opportunity! So save the date of Sunday, September 9, 2018. Visit www.BrewsterFallFestival.com for updated information, to sign up for the e-newsletter, to register for a vendor booth space or to volunteer. Sponsorship opportunities are available, interested parties should contact our committee! Hope to see you there!